I’m really excited to share today’s post, some last minute Halloween inspiration struck yesterday and these cute little chocolate mini donut spider pops were born! These are definitely not in the healthy treats category, but what is life without a treat now and again? These spider pops are really quick and easy to make so perfect for Halloween party food or desserts. I used ready-made mini donuts for speed and ease when making these but of course you could make your own mini donuts instead if you are feeling extra creative. Before anyone says it, these ‘spiders’ do only have 6 legs each (oops! ), but the little donuts I used weren’t quite big enough to accommodate 8! I filmed a quick video tutorial to demonstrate this recipe but I’ve also written the instructions out in full further down this post if you’d prefer to read them. If you have any trouble loading the video, click here to watch it on YouTube, and don’t forget to subscribe to the Eats Amazing YouTube channel while you are there for lots more recipes, tutorials and fun food ideas! This recipe would also make a great Halloween party activity for kids – just supply all of the ingredients and let them make their own! Start by melting the chocolate in a small heat-proof bowl. I melted mine in the microwave at 15 second intervals but you could also melt them in a glass bowl over a saucepan of hot water if preferred. Place a mini donut on a flat surface, chocolate side up. Push 3 mini matchmakers into each side for the legs. Don’t worry if they make a bit of a mess by squashing the middles in, it will be covered with chocolate. Push a cake pop or lollipop stick into the bottom of the donut. Using a teaspoon, dollop some chocolate into the centre of the doughnut and use the back of the spoon to level it out. Carefully add two candy eyes to the chocolate. Repeat with the rest of the donuts, then transfer to a plate or tray and pop into the fridge until the chocolate has set. Notes: I used a pouch of mini matchmakers chocolates but if you can’t find them you can use full size matchmakers instead – just break them down to size. You can also substitute the chocolate buttons for standard chocolate if preferred – I use buttons because they are easier to melt. I hope you enjoyed this simple recipe, do please pin it if you did! For more spooky spider fun, check out my spider themed foods collection! You may also enjoy my strawberry ghost pops, or for more spooky Halloween fun, check out the Halloween fun food section here on the Eats Amazing blog or pop over and follow my Halloween Pinterest boards for lots more fun ideas from around the web; Halloween Food, Healthy Halloween Food or Halloween Fun. 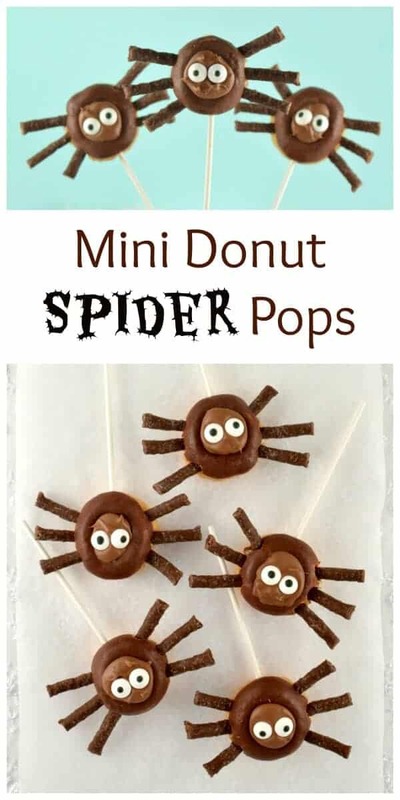 Easy Mini Chocolate Donut Spider Pops - fun treat idea for Halloween - perfect for Halloween party food. Place a mini donut on a flat surface, chocolate side up. Push 3 mini matchmakers into each side for the legs. Don't worry if they make a bit of a mess by squashing the middles in, it will be covered with chocolate. Repeat with the rest of the donuts, then transfer to a plate or tray and pop into the fridge until the chocolate has set then serve. Equipment: Lollipop or cake pop sticks. Notes: I used a pouch of mini matchmakers chocolates but if you can’t find them you can use full size matchmakers instead – just break them down to size. If you liked this fun Halloween recipe, please pin this post so you can find it again!